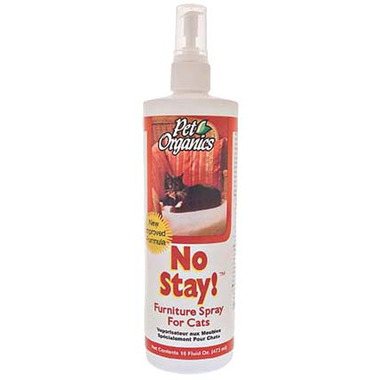 Pet Organics No Stay Furniture Spray for Cats is a special blend of natural herbs that most pets find displeasing and prefer to avoid. In training your pet to stay off furniture or other designated areas, this spray is a great addition to your technique. Active Ingredients: Sodium Lauryl Sulfate (1.26%), Garlic Oil (0.84%), and Clove Oil (0.84%). Inert Ingredients: Total Inerts (97.12%), Purified Water, Wheat Germ Oil and Glycerin.